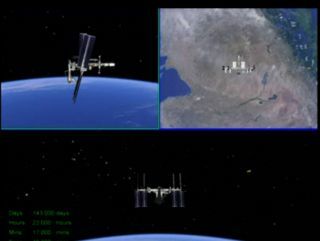 This still from a NASA simulation shows different views of how the shuttle Endeavour and International Space Station will appear on Monday, May 23, 2011, when a the crew of a Russian Soyuz capsule photographs the setup after undocking..
Space shuttle Endeavour, get ready for your wide shot. NASA's International Space Station mission managers on Friday (May 19) approved a plan to photograph space shuttle Endeavour while it is still docked to the space station from the perspective of a departing Russian spacecraft. Soyuz TMA-20 is scheduled to leave the space station at 4:23 p.m. CDT (2123 GMT) on Monday, May 23, to bring Roscosmos cosmonaut Dmitry Kondratyev, NASA astronaut Cady Coleman, and European Space Agency astronaut Paolo Nespoli home to Earth after five months in space. As they depart, rather than immediately leaving the vicinity of the station, they will pause to allow Nespoli to move to a window in the Soyuz habitat module and photograph the shuttle-station complex. "They will back out to about 200 meters," explained station flight director Courtenay McMillan. "You will see they are a little bit above the velocity vector, above the station, and that is to keep the sun out of the pilot's [Kondratyev] eyes." "After they get to the station-keeping point a few minutes later, ISS will begin a 130-degree maneuver. They will be moving at 0.2 degrees per second, so it will take about 15 minutes and it will basically bring the whole stack around so that we get a side view and a really good view of Endeavour," McMillan said. Nespoli will have about 15 minutes to take still photos and video using two cameras before he will remove their data cards, climb back into the Soyuz's descent module, seal the hatch to the habitat module, and return with Kondratyev and Coleman to Earth and a landing in Kazakhstan. Meanwhile, Endeavour's crew will be sound asleep ... or not. "They don't need to [be awake], there's no requirement for that and we're not going to ask them to," she said. Once the Soyuz crew and the cameras' data cards are on the ground, NASA and Roscosmos will work together to release the images as soon as possible, perhaps as soon as the following day. NASA had hoped to arrange a similar photo op in March, when the shuttle Discovery was docked at the space station, but Russian space officials passed on the idea because it would have required an unplanned Soyuz undocking and redocking. The photo of Endeavour at the space station was made possible because of the shuttle's launch was delayed by two weeks. That placed Endeavour at the station during the already planned Soyuz undocking to return the Expedition 27 crew to Earth. While acknowledging there was some engineering value to the imagery, Todd said the photographs were important as a testament to the station and shuttle for future generations. "I would like to think that they'd look back on their history and look back at what we accomplished between these two very, very large programs and the technology and the engineering that went into making the space shuttle do what it has done for this country ... and see that it was quite a feat to go do this with the technology we're dealing with in this particular timeframe," Todd said. For a video of the shuttle-station photo op plan and daily updates on Endeavour's STS-134 mission, visit collectSPACE.com's STS-134 Flight Day Journal.